Fancy able to control a missile launcher used in military and army? What’s more when you can actually launch the “foam” missiles to attack and hit at your “enemy”, or may be just to distract your friends? USB Missile Launcher is the desktop weapons platform, or you can call it a toy which connected via USB to your computer for remote control, that intends to kill your boredom or just to enjoy with your family. In fact, 2 companies have carried different design of USB Missile Launcher. 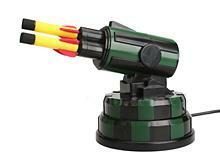 USB Missile Launcher from ThinkGeek (discontinued) can pivot 180 degrees horizontally, and 45 degrees up. 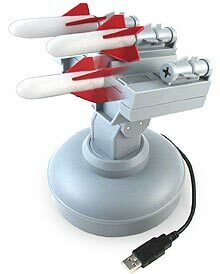 USB Missile Launcher stands approximately seven inches high, is gunmetal grey, with three 5 to 8 feet white foam spring-loaded missiles on top. The missiles are controlled by the included PC software, which when you press on big red shiny delicious button on screen, a missile will shoot. But too bad is that it’s not USB powered, instead it requires 3 AA batteries, which are included. However, you need to buy a new one once the battery life flat. There is also another USB Missile Launcher from Brando (discontinued) which uses USB to power, and thus requires no batteries. Other features include contains 3 foam missiles, includes 3 feet of USB cable, ability to move left right up and down, prerecorded sound effects, able to download your own sound effects and add them to your program, and able to shoots up to 20 feet at a extremely fast rate.